The Sunday Salon – Share with Me Your Favorite Graphic Novels – my books. my life. I reviewed my first graphic novel this week and since I received so many wonderful comments on that post, I thought I would ask all of you to help guide me through this new-to-me genre. What is your favorite graphic novel? What graphic novel do I NEED to read? Thanks in advance for the fantastic suggestions I’m sure to receive. Oooh, where to even start! I’ll live up to my Neil Gaiman fangirl reputation by recommending The Dream Hunters, which I think would be a perfect introduction to his work in comics. Also, Persepolis, Maus and Fun Home by Alison Bedchel are recommended to death, but with good reason. Bryan Talbot’s The Tale of One Bad Rat is not as well-known, but it’s a stunning book in every way. American Born Chinese is another deservedly popular choice. And if you’re willing to give Manga a try, Emma by Kaoru Mori is a must-read. Some of my favourite graphic novels are ‘Maus’ by Art Spiegelman (memoir of a holocaust survivor), ‘V for Vendetta’ by Alan Moore and David Lloyd (on what happens in England when a totalitarian government takes over), ‘Persepolis’ by Marjane Sartrapi (memoir of an Iranian girl), ‘Logicomix’ by Apostolos Doxiadis (on mathematics), ‘Asterios Polyp’ by David Mazucchelli (beautiful experimental work), ‘Black Hole’ by Charles Burns, Berlin : City of Stones, and Berlin : City of Smoke both by Jason Lutes (my most favourite graphic novel set in Germany between the world wars) and ‘The Arrival’ by Shaun Tan. Definitely read Persepolis, I really liked Exit Wounds (it´s about a father-son relationship in Israel), and heard good things about Maus, and try In the Shadow of no Towers, Spiegelmann´s work on 9/11, for controversy. I’m sort of a graphic novel virgin too. Well, I’ve read one and I have yet to review it. It is Fables which is actually a long series. I read the first one because i was so drawn to the cover and heard it was good. It takes place in NYC (yay!!) and is fairy tale characters that are living like regular humans (Snow White, Big Bad Wolf, etc.) and it was fun. I have the second one up to read too. 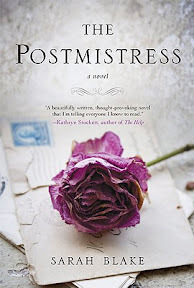 Looking forward to your review of the Postmistress! Persepolis & Persepolis 2 are excellent, and I think you mentioned already owning the 1st one. Highly recommended. Once you read those, I recommend Marjane Satrapi’s other graphic novels as well, they are all excellent. Asterios Polyp is fantastic. I think you should read it after you’ve read a few more graphic novels though. I think it would be even better once you’re more familiar with the genre. I tend to read mainly graphic novel memoirs, but I love Gabrielle Bell, who writes fictional graphic short stories. I recommend starting with Cecil and Jordan in New York, her latest book. Last but not least, Fun Home by Alison Bechdel is another great graphic novel memoir. I have much, much love for American Born Chinese and Persepolis. And I LOVED A.D. New Orleans After the Deluge by Josh Neufeld, which is about, you guessed it, New Orleans and Hurricane Katrina. Definitely an inspiring, emotion-inducing graphic novel/nonfiction read. Well, obviously Persepolis is awesome, although not actually a novel. I just wanted to say, you have some great books in your past, present, and future right now! Thanks everyone for the suggestions. Want to head to the library now and read them all.